The phrase I hear most often in my job is “he doesn’t lead me”. I never knew this was going to be the echo in my dance halls. Hearing this at least three to four times a week is like having three or four extra nagging wives. The first question I always ask the girl is: are you following? This is always met with a blank expression. Shock horror! They are moaning about something they don’t understand. How to lead in Ballroom Dancing – What we are told to do! Men are told to lead. Women are told to follow. It can feel very sexist. Yet no one ever explains how this is achieved. On Strictly Come Dancing, you will hear them talk about a strong frame and maintaining a connection with your partner. This is all good advice. However, that information alone will lead to a wrestling match. The man will win for a while until the woman has enough and erupts with fire and fury like the world has never seen (to quote President Trump). I will be covering the art of leading in a series of blogs. You can think of this as a step-by-step guide to crafting the perfect lead. So let’s get started! How to lead in Ballroom Dancing – Ballroom or Latin? It is normally the obvious things in life that we neglect. So I like to start everything from that absolute beginning. So the first thing you want to ask yourself is, what am I dancing? Ballroom? or Latin? 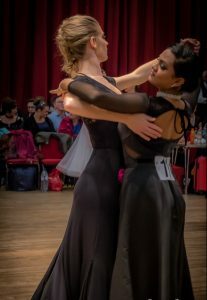 Leading in Ballroom is very different to leading in Latin. In this blog, we will cover the basics for leading in Ballroom. So let’s take hold of your partner. Make the hold strong, but not rigid. Strong means that your arms should have a little give in them. They should not be rock solid and stiff. Move into your partner so you have a contact in the body. It can be difficult to know where in the body you should feel the contact. This is because it really depends on your height and your partner’s height. So allow your teacher to assist you. 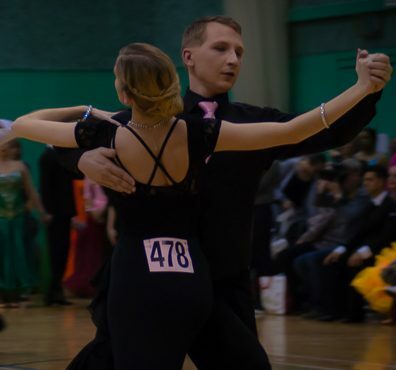 How to Lead in Ballroom Dancing – Connection points. The next thing you should know for your first stage is where the connection points are in your hold. There are two connection points which are the most important. The man’s left hand must hold the lady’s right hand with a slight tilt. You should feel almost as though the man is picking up the lady’s hand in his. The other connection point is on the right wrist for the man. The man’s right arm must, in effect, reverse karate chop the lady’s shoulder blade. Gentlemen, unless you want to feel that fire and fury, I would suggest a soft reverse karate chop. How to Lead in Ballroom Dancing – supported. With these two connection points, the lady should now feel that she has a little more confidence going backward. She should feel supported. Practice this hold just walking around the floor. You don’t have to dance. Just walk, changing direction when you feel like it. You will find, more often than not, that the lady will automatically come with you. This is because those connection points are working. Now, if you feel confident with that, combine the other two elements. Hold with your arms up in a strong but flexible manner. Then achieve some body contact with your partner. Just by doing these three simple techniques, you will find that your leading will become clearer to the lady. How to Lead in Ballroom Dancing – Next Blog How to Follow! Ladies, I will shortly be writing a blog on how to follow. However, I wanted to just add a very quick note for you to remember. Yes, you are meant to follow. The only reason ladies follow is that, for the majority of the time, they are going backward. This means that you can’t see where you are going. It is still important though that you know your own steps and your own technique. Be a strong independent lady on the dancefloor so when the man indicates what is coming, you are ready. Taking responsibility for your own dancing means you can dance with style, grace, and elegance. This is what ballroom is all about: the lady’s performance and not the male props. Thank you – a really useful article on how to lead in ballroom dancing. It’s amazing what a difference following these techniques makes.